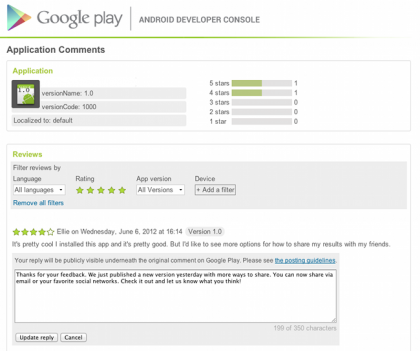 Developers are finally able to reply to comments on Google Play. It's no secret that this is one of the biggest requests by developers as most were, understandably, frustrated at not being able to help solve a simple issue for a user and improve their application rating. It's currently limited to Top Developers but expect that to be expanded come Google IO (in 9 days!!!). This is not just a big deal for developers, it's also very useful to consumers. Developers can now help solve a consumer's issue through the comments or at least help direct them to the proper steps to contact the developer directly. Hopefully, this will also reduce the amount of spam comments and instead lead to a better experience using Android applications.